The first aircraft off the Airbus A320-family final assembly line (FAL) in Mobile, Alabama has emerged fully painted from the paint shop. 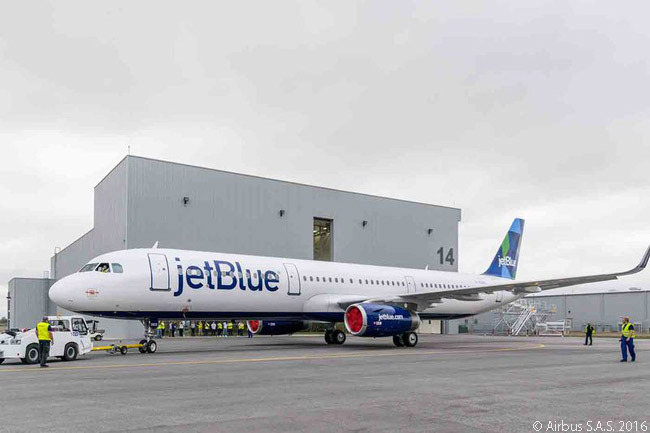 As www.AirlinesAndDestinations.com reported last September 15, the first aircraft off the new Airbus FAL – which is located at the Mobile Aeroplex at Brookley, just four miles from downtown Mobile – is an A321 for JetBlue Airways. The painting of the aircraft was performed by MAAS Aviation, which will paint all the aircraft assembled on the Mobile FAL. MAAS Aviation’s new aircraft painting facility is also located at the Mobile Aeroplex at Brookley, within the Airbus manufacturing facility campus. Now the aircraft is completed and its engines are installed, its avionics will undergo compass-swing adjustment before the A321 makes its first pre-delivery test flight in the next few weeks. 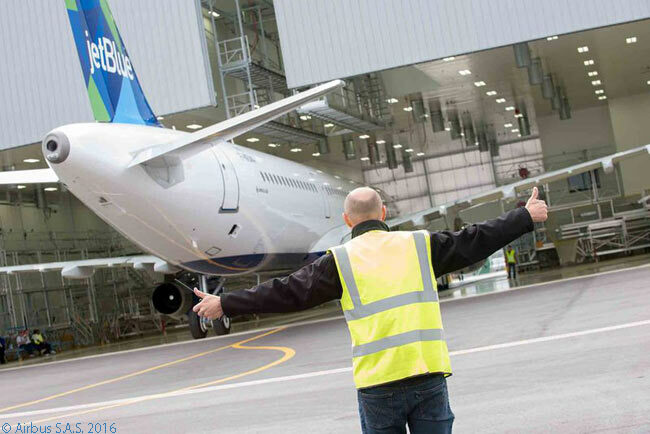 JetBlue expects to take delivery of the aircraft this spring. The second aircraft off the line will be an A321 for American Airlines and will also be delivered this spring. Indeed, Airbus revealed on September 13 that 49 of the first 50 aircraft to roll of the Mobile FAL will be A321s. Because U.S. carriers have ordered large numbers of A321s and A321neos and Airbus forecasts that most of the passenger traffic growth in the U.S. over the next 20 years will arise from airlines using larger aircraft on existing routes, the manufacturer expects the Mobile FAL mainly to produce A321s rather than smaller A320-family jets. Although the manufacturer has not officially ruled out that aircraft delivered from the Mobile FAL could go to customers outside the U.S., Airbus expects every aircraft produced there in the foreseeable future to go to a U.S. customer. American Airlines, Delta Air Lines, Frontier Airlines, Hawaiian Air, JetBlue Airways, Spirit Airlines and Virgin America all have outstanding orders for A320-family and A320neo-family aircraft and all seven carriers have A321s and/or A321neos on order. Additionally, also in North America, Mexican carriers Interjet, VivaAerobus and Volaris have sizable outstanding orders for A320-family and A320neo-family aircraft, including A321s and A321neos. Airbus plans to ramp up production at the Mobile FAL to a rate of 50 aircraft a year by late 2017, by which time it estimates it will have produced its first 50 aircraft there. 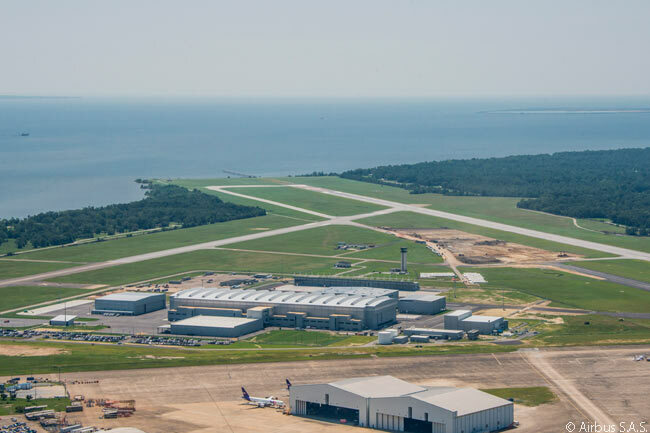 Although the existing 116-acre Airbus FAL site at Mobile can produce a maximum of 50 aircraft a year, Airbus has negotiated the right to purchase another, adjacent 116-acre site at Brookley so that, if customer demand for A320-family jets makes it necessary, the manufacturer could expand Mobile FAL production to 100 aircraft annually.